NICI Zebra is the official endorser for Asian Home Gourmet Thai Red Curry spice paste. Of course not, why would Asian Home Gourmet ask a NICI Zebra plush toy to endorse a curry spice paste. Well perhaps in the future they will *blink blink* we really don't mind! 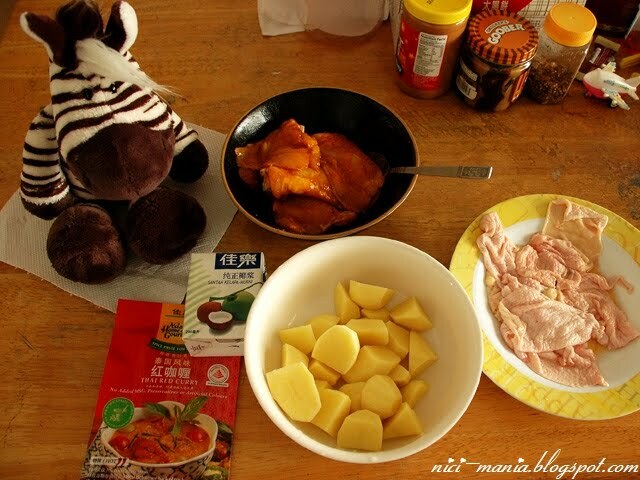 Story goes..
NICI Zebra had curry chicken with us during the weekend. It was a haphazard meal as we did not plan to take any pictures of NICI Zebra while cooking this lazy meal. We were passing by the supermarket and saw a packet of Asian Home Gourmet Thai red curry spice paste, then it suddenly struck us that we had potatoes and some chicken thigh in our fridge, and also coincidentally a packet of coconut milk in stock. The coincidence never ends do they. We love curry chicken and we often cook curry chicken but this is one of the few rare occasions we're cooking curry chicken with a ready made spice paste. The usual process of peeling the onions, garlics, chopping up the chili, mixing the curry powders and blending them all together got to us as a tedious task today. Getting a ready made curry spice paste from Asian Home Gourmet saves all the trouble, best of all there's no added MSG, preservatives or artificial coloring! Hey, we already said that our NICI Zebra is not endorsing the Asian Home Gourmet curry spice paste, stop advertising! There you go again! NICI Zebra secretly takes us back 20 minutes to show you a picture. We added our own extra curry powder, turmeric powder and chili powder with a tablespoon of salt and a tablespoon of sugar. Marinating the chicken this way lets the curry taste sinks deep into the big piece of meat with the salt and sugar working as meat tenderizers. The instructions behind the Asian Home Gourmet curry spice paste says we fry the curry paste and also half the pack of coconut milk in medium heat oil. Doesn't that sound very familiar to the Thai Green Curry recipe we done previously? We made chicken oil from the chicken skin that we peeled off from the thigh meat as you can see from the first picture in the separate plate on the right. After that we used that oil to fry the curry paste and coconut milk until it is fragrant and then only put in the chicken. The potatoes come in last after we fry the chicken for a while until it turns a little brown. The Asian Home Gourmet curry spice paste is already salted, you don't need to add any more constituents other than coconut milk. After which, we will add water enough to cover the ingredients and bring to boil in medium heat all the way for about 15 minutes while adding the remaining of the coconut milk when its almost done. NICI Zebra presents to you instant Thai red curry chicken! We saved about 15 minutes in preparing but NICI Zebra thinks that our own made curry paste taste better than the ready made Asian Home Gourmet curry spice paste. Not a fair comparison as we add lots of other extra ingredients to our own curry paste, so next time we will show you in detail the real Malaysia style curry chicken recipe. The small plate beside NICI Zebra is the fried chicken skin after we extracted all the oil, its extra crispy and delicious just like a snack! That looks good, we always bring recipes very rich haha. Hugo, the only pirates I'll buy the bear, for lack of money and space haha, I'll buy the next month. The panda and buy it online because the store where you bought is not going to bring. Now Ute is waiting for a man like Scotty to beam her to malaysia for having Thai Curry haha. Would be great fun with three Jolly Rosa at one table. And perhaps other Jolly Rosa also would join for a special sheep meeting - and the Hugos would get a little nervous...I`m sure your Rosa will no longer have time to be jealous when the pirate comes along. Then she will only have eyes for the wild womanizer haha.